Two high-end residential complexes are expected to open this year at riverfront gateways to Columbia, offering tenants some of the most unobstructed views of the Congaree River and the Capital City’s skyline. Both projects are along the river’s west bank and near two of its main bridges. Flow on the River, going up on Sunset Boulevard near the Gervais Street bridge in West Columbia, is a 24-unit condominium complex with units ranging in price from $380,000 to $490,000 – near a chicken processing plant. The Cayce project near the Blossom Street bridge is a 224-unit luxury apartment building. Flow on the River is expected to open in the fall. It is designed as a three-story, gated community offering easy access to eight or nine miles of walking and biking on the Riverwalk and shopping and socializing in Columbia’s popular Vista district. Being indoors at the complex shouldn’t be a shabby experience. All the condo units are to feature three bedrooms and 31/2 bathrooms, development partner Wade Caughman of FOS Development in Greenville said. The units will range from 2,100 to 2,800 square feet, Caughman said, and each will have an elevator. They will offer wooden interior and exterior finishes, high-end appliances, hardwood floors and a riverfront pool. The second row of units will be elevated 10-to12-feet above the front one so all will have scenic views, Caughman said. “We’re pretty excited about it,” he said, noting he and partner, Bill Bradshaw, have worked on the project for nearly a year. Caughman said 14 units have been purchased. Five riverfront and six second row units remain. The complex, doors from the House of Raefords Columbia Farms poultry plant, also is near Bridgepointe, a high-rise condominium. Caughman bought the land from the city of West Columbia for $300,000, records show. 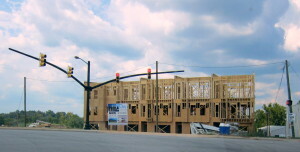 The Cayce luxury apartment complex, tentatively named One Eleven Apartments, was announced in May and is being built at the eastern end of Knox Abbott Drive at the river, where a Monterrey Mexican restaurant and the Riverside Inn once stood. The three-story complex will feature an interior structure surrounded by a building closer to Knox Abbott Drive, developer Hunter Gibson said. Tenants can chose between 600- to 1,500-square-foot units. Rental rates have not been set yet and first occupancy is expected around the end of the year, Gibson said.